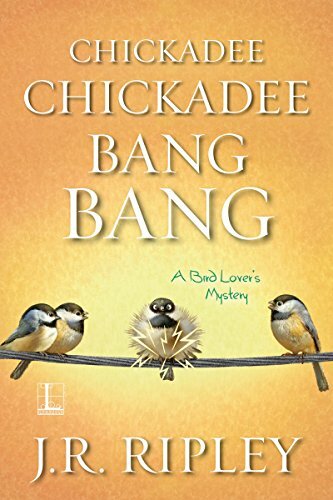 Today I’m happy to bring you a stop on the Great Escapes Virtual Book Tour for J.R. Ripley’s Chickadee Chickadee Bang Bang, which is the 5th book in the Bird Lover’s Mystery series. Thanks for joining me today for my stop on the Great Escapes Virtual Book Tour for Chickadee Chickadee Bang Bang. If you wish to visit other participants in the tour, please click on the banner below. It will take you to the main tour page where you will find a list of tour participants. Today’s post is part of the Great Escapes Virtual Book Tour for “Towhee, Get Your Gun” by J. R. Ripley. If you wish to visit other stops along the tour, click on the above image and it will take you to the list of dates and blogs that are participating in the tour. “Towhee, Get Your Gun” is the 2nd book in The Bird Lover’s Mystery series by J.R. Ripley. I liked the storyline and the setting, but the characters, eh, not so much. You can read my review below the synopsis. 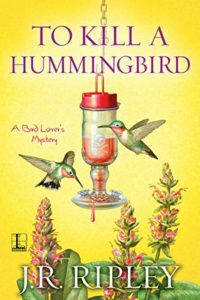 What do you get when you cross murder with theatrics and bird watching? Mayhem and madness! This is a very well-written book. As I said above, I really liked the story line and the setting in this book. Ruby Lake sounds like a lovely small town. I wouldn’t mind visiting it or even living there if it wasn’t fictional! The story line of the actress, the play in town, trying to save the town theater, and Amy still somehow run the birdwatching supply store made for a compelling plot. It was well-written and I had no idea who the villain was until it was revealed, which is always a plus in my opinion. In fact, I was totally off on another tangent and didn’t foresee the villain as the villain at all until it was revealed! Nevertheless, I did not care for the characters much. I felt like Amy didn’t have much of a backbone and that she took far too many chances. I felt that Kim was far too overbearing and overstepped her boundaries many, many times, without Amy sticking up for herself and saying “no”. I don’t mind amateur sleuths who pass information on to the police because of things they hear about in their jobs or while out and about in town. I don’t mind amateur sleuths who attempt to talk about the crime with people in the town in hopes of eliciting clues. I do mind amateur sleuths who deliberately take chances that they really don’t need to take. I do mind amateur sleuths who think they’re smarter than the police and seek to upstage the police by solving the crimes themselves. Amy, I feel, falls into this latter category. Some of the chances she takes in this book are ludicrous to me. I just could not like her and her antics. However, don’t let this discourage you from reading the book. It is very well-written and has a great plot to it. I didn’t care for it only because of my preferences when it comes to amateur sleuths, not because it was a horrible story. If you don’t mind your characters taking what seem like unnecessary chances, you will probably enjoy the book! J.R. Ripley is the pen name of Glenn Meganck, the critically acclaimed author of the Tony Kozol mystery series. As a member of the Mystery Writers of America, he has chaired the Edgar committee for Best Original Paperback novel and served on the Best Short Story Committee. As a member of the International Association of Crime Writers, he has served on the Hammett Award committee for Best Novel. When not writing books, Glenn is writing songs, often singing them to the consternation of his audience and neighbors, or involved in one of his many passions, none of which have involved any of the dead bodies that seem to keep cropping up in his mysteries. For more information about him, visit www.glennmeganck.com.